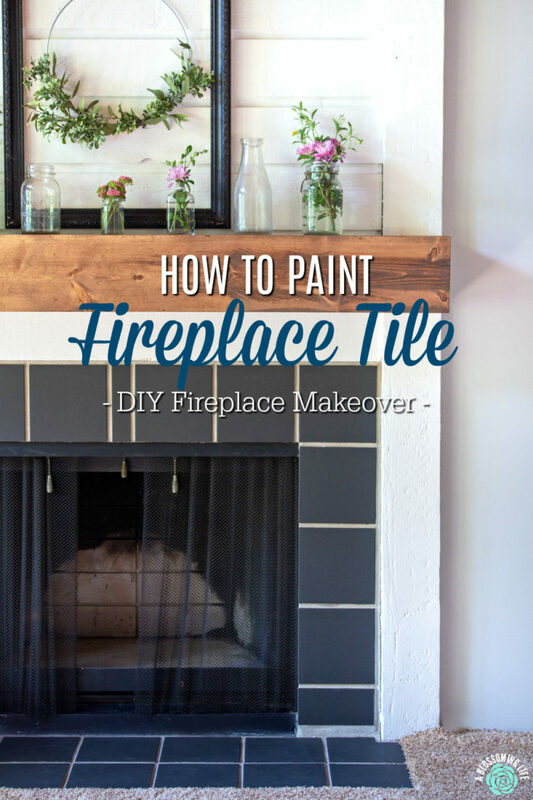 Transform your fireplace on a tight budget with this easy step-by-step tutorial on how to paint your fireplace surround and tile. Plus, learn how to easily paint stained wood with low VOC products. This post is sponsored by KILZ®. All opinions are 100% mine. My husband often tells me I have too many ideas. Sometimes he goes with the ideas, sometimes I get a good old eye roll, and other times, he just quietly thinks I’m a bit nutty. After the last few projects, he has really started to see my vision and maybe even trust my crazy ideas just a little bit more. Not a big deal, though. He worked hard on a few other house projects, so I can take this one. And, thankfully, I had my right-hand woman, Abby, to help me. You know you have an amazing friend when she first says, “Let me know when you want me to come over to remove wallpaper!” Do you know a single person who likes to remove wallpaper? No, no you don’t, because it’s not a fun job. She was there for almost every step of the project. We painted and talked about life while our little girls played. Whoa! So bad on so many levels. The stained cedar posts, which were rough, fuzzy wood, plus stained cedar shiplap, and the worst orange, bamboo grasscloth wallpaper. The previous owners had cats, and they obviously loved (or maybe hated) that wallpaper as they had scratched it up in spots. Then there was the orange, brown, and tan flower tiles. So 70’s and not my style. Also, that TV came with the house. Most expensive TV we’ve ever purchased. First, we removed all the wallpaper using a scraper and water/vinegar/soap mixture. We removed as much paper as we could and then sanded off the rest. Then we primed the walls with KILZ 2® LATEX Primer and painted it with KILZ COMPLETE COAT® Paint & Primer In One in Origami. Give the fireplace surround a good sanding with the electric sander with 100-150 grit sandpaper. The fuzzy, wood posts were sanded to almost smooth, and the shiplap got a light sanding. Move in the direction of the wood. Pass a second time with 180-220 grit sandpaper for a smooth finish. Clean up any dust from sanding using a vacuum and a damp paper towel to get any fine particles. Allow to dry. This is the part I’m really excited about. I wanted a way to prime the cedar wood without the tannins coming through and without harmful toxic fumes (small children live here, folks), and thankfully, KILZ PREMIUM Primer came to the rescue. It is very low VOC and low odor! I could paint with the baby around and not worry. I wish I knew about this product before we painted the shiplap in the kitchen. We used a regular oil-based primer and I was a complete wreck worrying about the fumes for a week. We left the house for a few days, too, just to be on the safe side. Not with KILZ PREMIUM Primer, though. This stuff worked wonders! I ended up doing three coats of KILZ PREMIUM Primer to be extra safe (two coats probably would’ve sufficed). Paint primed wood with KILZ COMPLETE COAT Paint & Primer In One in Swiss Coffee. It’s my absolute favorite shade of white and is the trim color in our whole house. Sand tiles to help roughen them up and allow paint to stick better. Some say it is not necessary, but I wanted to make sure the paint adhered well. Wash tile with non-detergent soap and water or TSP. Wipe with water and allow to air dry. Tape off areas you don’t want to accidentally paint. 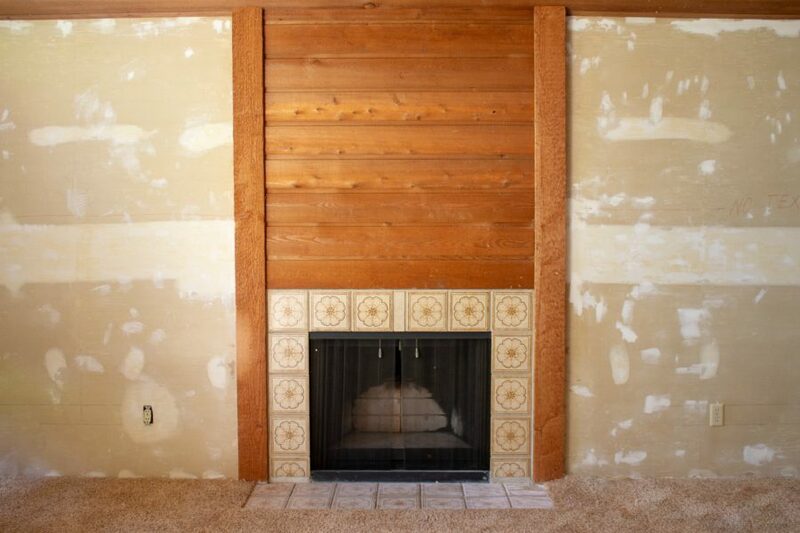 Pro tip: If your fireplace is surrounded by carpet, gently press the carpet away from tile and cover with tape. Then, tuck tape along tile line. 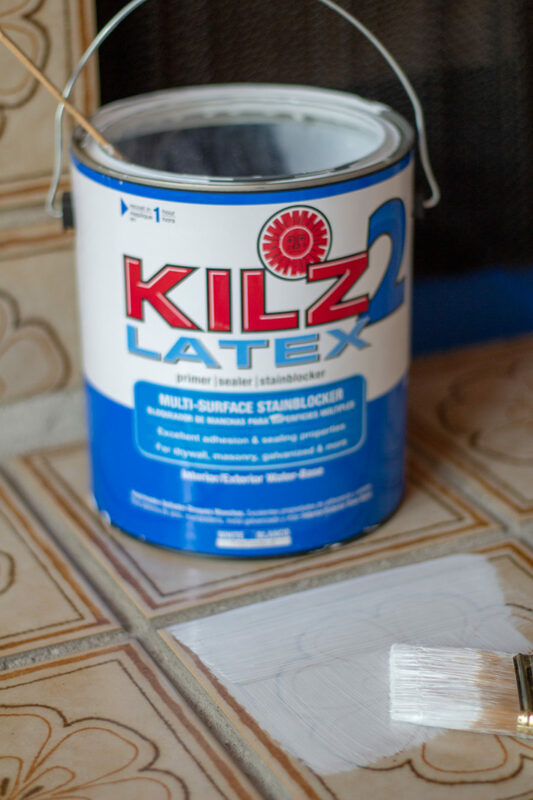 Prime the tiles with KILZ 2 LATEX Primer. You choose whether the grout gets painted. 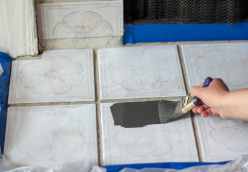 I wanted an authentic tile look, so I chose to carefully paint the tiles and not the grout lines. Allow the primer to dry for 1-2 hours. 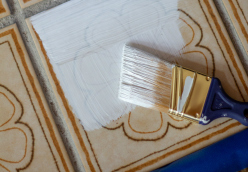 After the primer is dried and right before you paint the tiles, wipe tiles off with a clean, dry towel just to make sure there is no dust or particles on the tiles. Especially if you have a hairy husky… ahem. Pro tip: Use a short-handled brush to give you more control when painting. Also, I found it easier to create crisp, straight lines when my brush had a fair amount of paint on it. 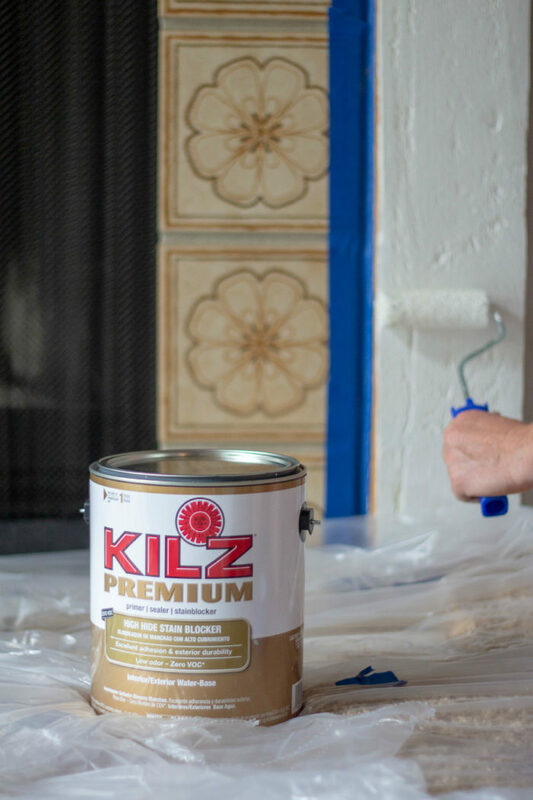 Paint the tiles using KILZ COMPLETE COAT Paint & Primer In One – Toasted Poppyseed in flat. To go for a concrete tile look I opted for a flat sheen, but you could also use satin. Allow to dry. Apply second coat, if necessary. 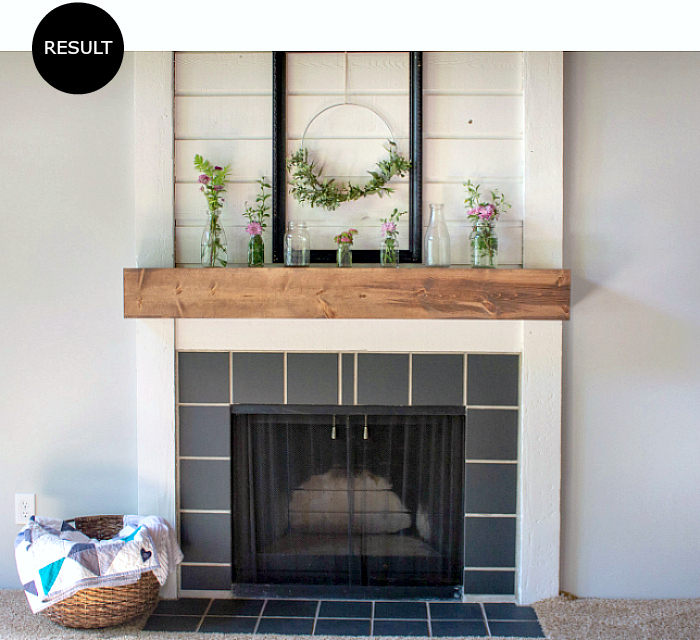 To give it even more pop, we built a wood mantel to go with it. That DIY will come shortly. Stare at the amazing transformation. I can’t believe how gorgeous this came out and it didn’t cost much at all. 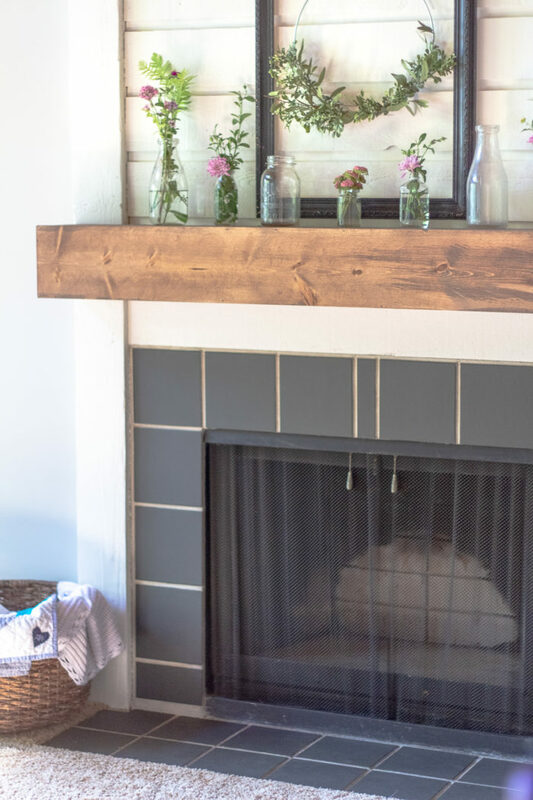 A fireplace renovation could easily cost thousands of dollars, but this one cost less than $100, and now I have lots of supplies for other projects around the house. I only needed a quart of the Toasted Poppyseed, but bought a gallon, just in case. Same with the Swiss Coffee, but we still have lots of trim and doors to paint… eventually. 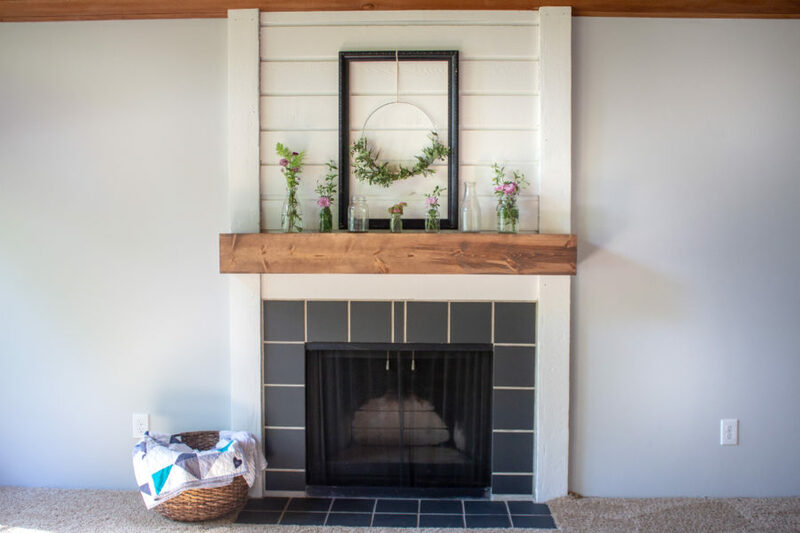 So, if your fireplace really needs a face-lift, but you don’t have a ton to spend, lots of elbow grease and some paint could give your space a whole new look! Thank you, KILZ, for sponsoring this post and transforming our formal living room! 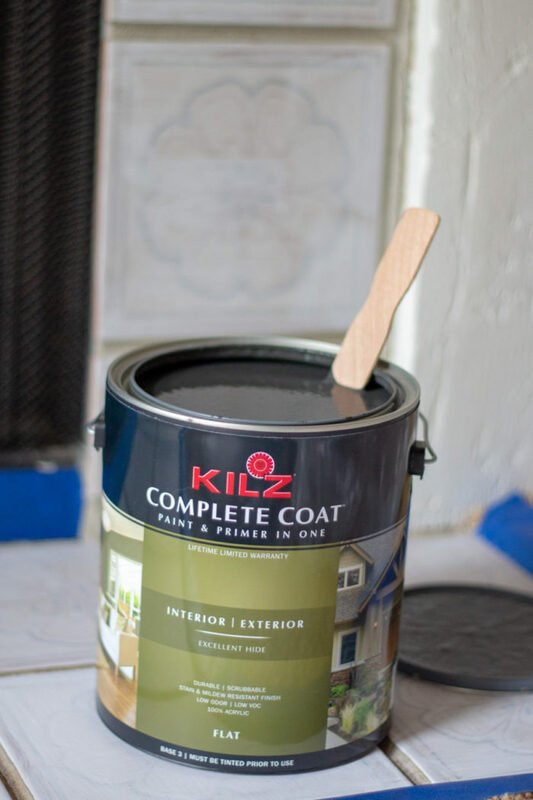 To help you create a beautiful space, I’m giving away a $100 Walmart® gift card to one lucky winner so you can pick up your own KILZ COMPLETE COAT Paint & Primer in One. To enter: Comment below on how you would use KILZ to transform your space. One lucky winner will be entered for a chance to win $100 gift card to Walmart.. I would love to win! Maybe it would be the motivation I need to do a makeover on an old desk I have! The result looks incredible, thank you for sharing this. I always find it fun to do things on your own, it helps you to stay creative. Cheers! We need to repaint the kitchen ceiling after the roof leaked. Not a glamorous makeover, but necessary. Ugh I know that feeling Mary! We had the same thing happen at our old house! My youngest son just bought his first home and it needs painted. I promised to help before he bid on the house and I’m keeping my word. It all needs painted – ceilings, walls and woodwork. The Kilz would be amazing for any and all of his painted surfaces. You’re such a good mom Heidi! Looks great in pictures and in person! 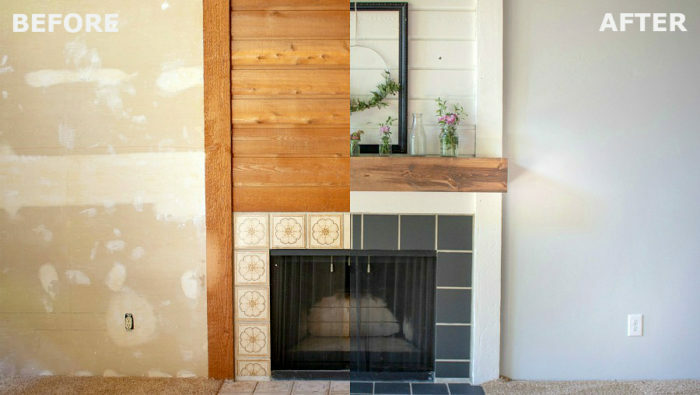 Kilz really covered every part of the old fireplace. Wouldn’t have ever known what was under there. Right now, I have been trying to clean the black marker “art mural” of my 3 year old off the wall. Not really working. Probably need to get that kind of coverage! The fireplace looks great! Can’t wait to see it in person! I’d use KILZ to redo my coffee table. 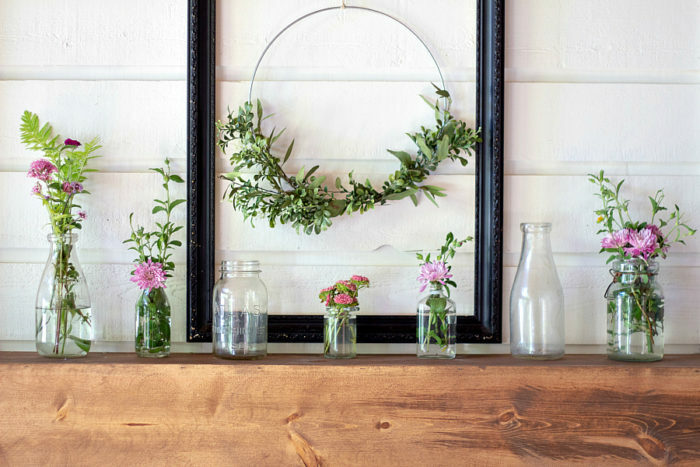 It’s a thrift purchase we made years ago, such a handy piece but but could use a fresh look! There’s some ugly wallpaper in my kitchen as well as some painted plywood used to make a pantry. I would use KILZ on those spaces (after I removed the wallpaper) and make my kitchen more up-to-date. Removing wallpaper makes such a huge difference! Good luck with your project Annette. Looks great Amy! We just bought a house and I think our first project will be painting our kitchen cabinets (which are currently wood). 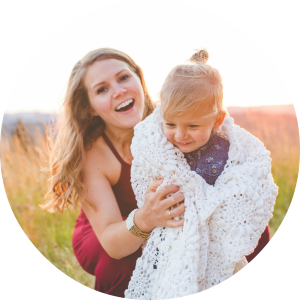 We’ve used KILZ for other projects and it’s awesome. I would paint the ancient wood panel wall of our living room, right next to the front door. Maybe add some color to the room, or maybe an off-white. 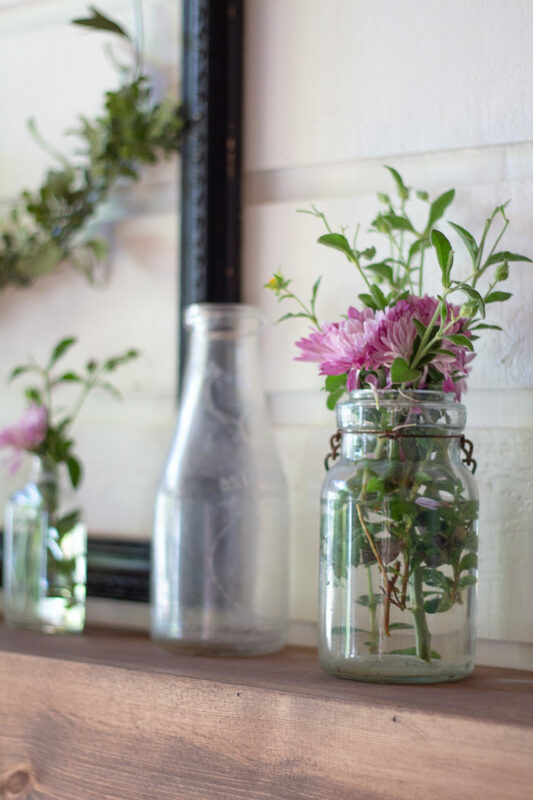 I would use it up to cover up a dark accent wall color and to refresh the smell that walls can harbor. My new apartment came with a horrendous orange wall in the living room and awful bright yellow kitchen that we are allowed to paint! Wow, I’m really impressed with your project! I had no idea that ceramic tiles could be painted like that. My project would be much less exciting, but I need to repaint a few rooms. One has paneling that could definitely use a coat of Kilz. I’m using KILZ right now to paint our kitchen cabinets! Wow! What a beautiful transformation! I love it! I would definitely use this on my Nana’s brick fireplace. It was previously painted a tan color… ew. So I would love to paint the bad boy white, I think it would look SO much better! This fireplace turned out gorgeous! The coverage from KILZ did a great job and I can just imagine the time and effort it saved you. I love the mantle piece too! My next project is to create built in book shelves, with a cat house. I need paint that can stand up to the constant wear and tear brought on by constantly cleaning the space. I’ve used KILZ before for other projects and hopefully they will work on this one too! This makeover is fabulous! It’s amazing what a little paint can do!!! Hi, is the kilz heat safe for the fireplace? Thanks! Hey Jen, it is not. Since it is on the outside of the fireplace it won’t get hot enough to effect it. There is specialty paint if you wanted to paint the inside of a fireplace. I wonder if this will work on kit hen tile backsplash as well. 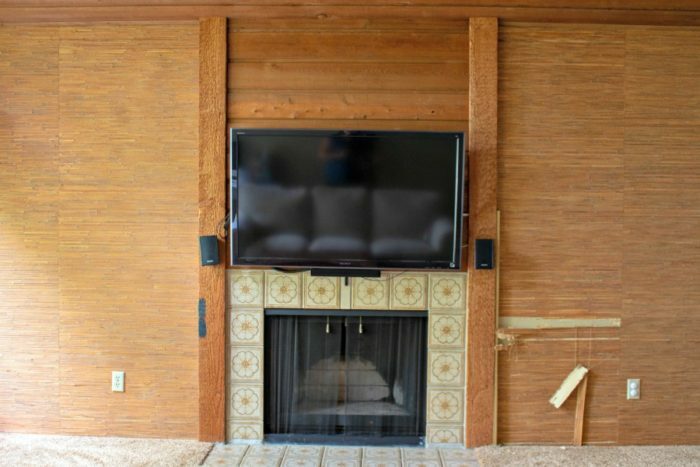 Did you use the electric sander on the fireplace tiles? Yes I did. But you could probably use a hand one also. Thanks for listing out the materials and doing a step by step instructions on this! My husband and I started renovating our home last week and we’re redoing the paint of our house. Really helpful! How is the floor tile holding up with traffic? It has a few scuffs on it because someone put a chair on it, sat on the chair, and then scooted the chair on the tiles… But I just touched it up and it’s good to go. Totally worth it painting it.